Babies are all wrinkled after childbirth. Sometimes they look cute and perfect. They smell nice and everything, but it is not unusual for other people to think that they look kind of weird. This is because their features are too small or some are growing faster than others to the point that they look unusual. As a parent, beyond their looks, you may even find some behavior alarming. In particular cases, the features are indeed weird, but many of these are natural and should not cause panic. The heads of babies sometimes look shapeless. This is not a cause for alarm as it is common for this to happen due to their being squeezed through the baby canal. Sometimes they have weird depressions on their sides caused by forceps or any other kind of pressure used on them during birth. Sometimes the birth is harrowing, and in the process of getting the baby out, the face comes out looking bruised. In such cases, you will notice the face is swollen, or some features such as the nose will look squished. An infant’s head is initially soft and malleable. Squeezing through your pelvic bone and the birth canal can definitely cause some deformity. Your baby being all purple and swollen-looking should not worry you since these are just signs of the childbirth that both you and your baby worked hard for. There is no cause for alarm due to the odd-shaped head of your baby. As your baby learns to relax from the birth trauma, , these issues will correct themselves. If a harrowing childbirth doesn’t cause your baby’s head to be of an odd shape, lying on his back too much after birth probably will. If you notice his head flattening after lying down too much, try to hold him in your arms more often. Also, try placing toys that attract his attention on alternating sides so that he may avoid staying still on one side. If you still find that your baby’s head is still oddly shaped even after you have given him time to relax and have avoided laying him down on his back too much, maybe it is time to consult your pediatrician. Your baby may be advised to temporarily wear a helmet in order to shape his head into a more normal form. It is best to correct the shape of your baby’s head during his first 4 to 6 months since this is the period where his head is still malleable enough to be molded. Cradle cap, or scientifically known as seborrheic dermatitis, can be seen on a baby’s head as dry, pink patches with a scaly and waxy texture. The waxy texture of cradle cap makes it different from other forms of infant rashes. It is called cradle cap primarily because of its location. It can only be seen on a baby’s scalp, extending to his forehead, eyebrows, ears, and behind the ears, while the rest of the body is without the waxy rash. There are no diagnostic tests for cradle cap and doctors can usually tell by just examining the presenting rash. There is really not a known cause for cradle cap. If your baby has cradle cap, absolutely do not worry. It is pretty common among newborns and it is commonly present during the baby’s first two to four weeks. Most cases of cradle caps resolve themselves by the time the baby turns one year of age. Though not considered to be a medical crisis, you can still do something about cradle cap. It can be managed by applying baby oil or ointment on your baby’s scalp. You may gently remove the scales by using a soft brush against your baby’s skin. Dandruff shampoos are recommended by doctors for babies who have severe cases of cradle cap, since cradle cap is essentially dandruff. Low dosage steroid creams may also be prescribed to manage any presenting severe redness. To prevent your baby from getting cradle cap, you may wash his hair with a gentle shampoo every few days. It is absolutely normal to observe some boobage on your baby. Do not be weirded out when your baby has somewhat large breasts. Having large breasts is just one of the side effects from being exposed to hormones during those 9 months of pregnancy. This exposure to hormones may cause the breast tissue of your baby to develop temporarily. Hormones take time to wear off, so do not make haste. In time, your baby’s breast will have grown to its normal size. Should you notice that your baby’s breasts are swollen and have some redness around the area, your baby might be under a fever and a visit to the doctor might be called for. New born babies experience various eye color changes in the span of their first year. It is not unusual for a child’s eyes to be one color today and a different color the next. Wait for a year and the real color will manifest itself, so there is no cause for alarm. Newborn babies will need some time before they completely master their muscle control and fine-tune their skills. Mastering his sense of sight is one of these skills that will need a little bit of time, so it should be understandable if you observe your baby to be a bit cross-eyed. Sometimes, however, it may just be an illusion called, pseudoesotropia. This happens when we perceive the baby’s eyes to be crossed when, in fact, they are not. Some parts of the white area of the baby’s eyes may just be masked by the extra skin folds,which make the eyes appear to be crossed. However, if upon closer examination, they appear to be indeed crossed and have not been corrected by your baby’s sixth month mark, you might have to consult your pediatrician about it. If you spend a long time in water your skin wrinkles, and the same happens to babies after spending nine months in the womb. This will change in time. Some babies have blue hands and feet which are caused by a circulatory system that is not fully developed. It is not yet used to change and needs to strengthen. This happens within a short time after birth, so there is no cause for alarm. It’s also common for a baby to look jaundiced especially when you look at the whites of their eyes. This phenomenon occurs in a large number of babies, but it clears in ten days after the birth of the baby. If you notice red spots with whitish centers on your child’s skin, don’t be alarmed as new born babies often develop rashes. You may also notice blue patches on the lower part of their bottoms especially if your child has dark skin. Other strange spots are blotchy red patches on the face and neck similar to bruises. All these are standard features and will disappear within a year and a half of the baby being born. Due to prolonged exposure of babies to the hormones of the mother, it is pretty common for babies to have abnormally large genitalia. In baby boys, their genitalia may be darker in color compared to the rest of the body. His testes may be significantly larger than you would expect them to be. Do not worry so much as there just might be extra fluid that has built up in his testicle sacs. This extra fluid will eventually be flushed out with his pee in a few days time. Babies shed all the excess fluid in their first few days. This will get rid of all the swolleness in the body and will decrease their weight by around 10 percent. If you have given birth to a baby girl, her labia may appear to be swollen. As with baby boys, the puffiness will eventually go away on its own. Don’t be surprised if your baby girl has vaginal discharge or some streaks of blood. These aspects are down to the baby’s body getting rid of any remaining hormones from the mother that are left in their system. If it has been a few days after delivery and the swelling still has not gone away, go get your baby checked just to be on the safe side. Yep, you read that right. Get yourself ready for some poop action since diaper blowouts with newborn babies are bound to happen. They are inevitable. They may even be considered a rite of passage into becoming a full-fledged parent. Some parents consider newborn poop as explosive poop, probably owing to some incidences where poop had to be cleaned off of the nursery walls. How did poop get on the walls? Consider projectile action. Diaper blowouts and poop explosions are quite common, so don’t be quick to assume your baby has something special going on. The bowel movements of a newborn is mostly made out of liquid, which has some sort of mustard-seed texture. Being that it is mostly liquid, a little exertion from the part of your baby could propel it into a projectile path. There is no need to worry when your baby’s poop is quite liquidy. So long as the color ranges from brown to green or yellow and it has a seedy texture, your baby should be fine. Seeing any signs of blood, however, is another story and consulting your baby’s doctor should definitely be your next move. Is your baby constantly sneezing? Don’t think too much about it, too quick. Your baby is bound to be extra sensitive to a number of things that he will be exposed to in his new world. Things to which us parents are already immune to. If your baby keeps sneezing, check if he is coming down with a fever. If he is not sick, he is probably sneezing as a reflex to expel little particles that may have been caught in his nasal passages or to expel extra mucus and amniotic fluid from his respiratory airways. Looking at the light can also cause a newborn to sneeze so taking baby out for a walk on a bright and sunny day may cause him to sneeze up a storm. However, if your baby’s sneezing feat is accompanied by wheezing, he may be suffering from an allergic reaction or a respiratory disorder. Immediately consult your baby’s pediatrician for proper management. It is understandable to be all gooey when your baby makes the cutest cooing sounds, but do not be weirded out when he starts groaning, snorting, grunting, and making other odd, funny sounds. It is normal for babies to make these strange and funny noises. These sounds are due to the nasal passages of newborns, which are pretty narrow in their first weeks. Due to the narrowness, mucus may sometimes get trapped between the passages, further adding some sound effects that you might hear coming from your baby. If you happen to encounter these sounds regularly, do clear out your baby’s nose with the use of a nasal aspirator. Worry when your baby seems to grunt with every breath. If you notice this happening, your baby might actually be having a difficult time breathing. Get your baby to your baby’s doctor immediately. 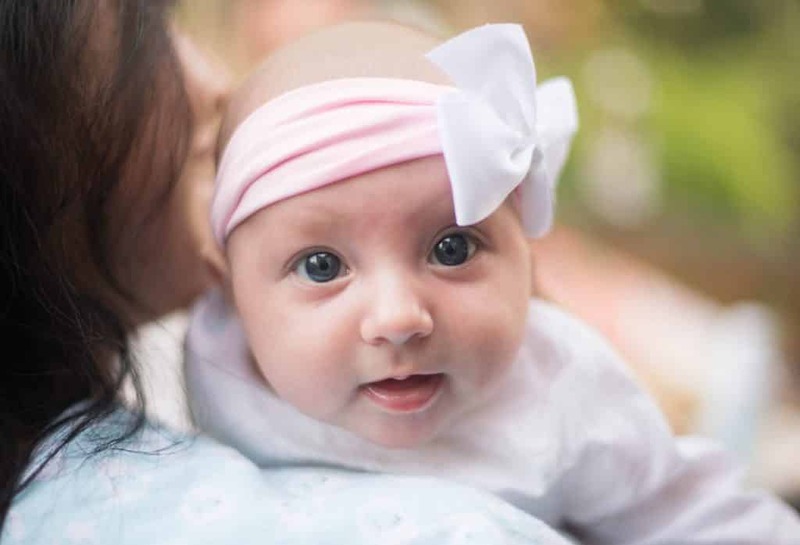 The primary idea with strange features on your baby is that as long as your child is healthy, the strange features will even out within a year after their birth date. Avoid panic and concentrate on caring for the baby as required. If you are really in doubt, ask the doctor to put your mind at ease.